This is “Identifying and Managing Bottlenecks”, section 7.8 from the book Accounting for Managers (v. 1.0). For details on it (including licensing), click here. Understand the theory of constraints. Question: As we noted in Chapter 6 "How Is Cost-Volume-Profit Analysis Used for Decision Making? ", many companies have limited resources in such areas as labor hours, machine hours, facilities, and materials. These constraints will likely affect a company’s ability to produce goods or provide services. Companies facing constraints often use a variation of differential analysis to optimize the use of constrained resources called the theory of constraints. What are constrained resources, and how does the theory of constraints help managers make better use of these resources? Answer: Constrained resources are often referred to as bottlenecks. A bottleneckA process in which the work to be performed exceeds available capacity. is a process in which the work to be performed exceeds available capacity. The theory of constraintsA five-step approach to managing bottlenecks. is a recently developed approach to managing bottlenecks. We will look at an example to help explain how the theory of constraints works. Assume Computers, Inc., produces desktop computers using six departments as shown in Figure 7.15 "Production Process at Computers, Inc.". Computers are assembled in departments 1, 2, and 3 and are then sent to department 4 for quality testing. Once testing is complete, products are packaged in department 5. Department 6 is responsible for shipping the products. 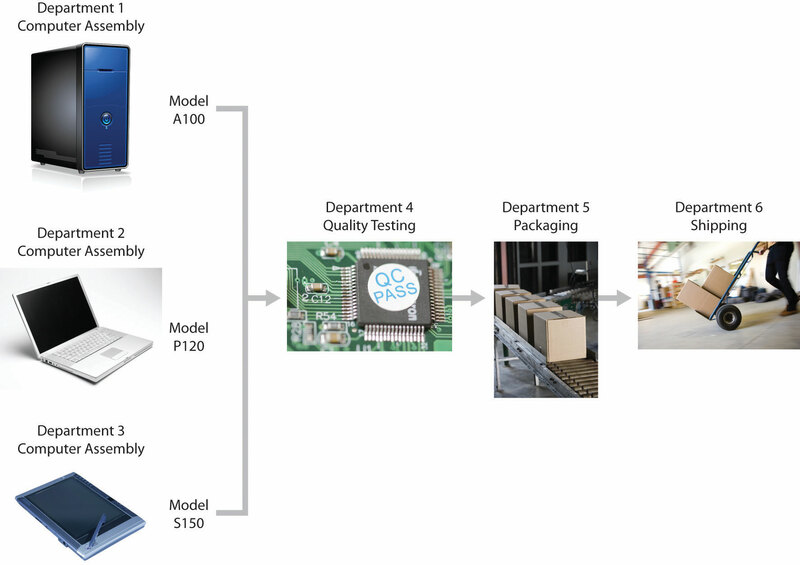 Figure 7.15 Production Process at Computers, Inc. Question: The theory of constraints provides five steps to help managers make efficient use of constrained resources. What are these five steps, and how will they help Computers, Inc.? Answer: The five steps are described here, with a narrative indicating how Computers, Inc., would utilize each step. Step 1. Find the constrained resource (bottleneck). In this step, the process that limits production is identified. The management at Computers, Inc., has identified department 4, quality testing, as the bottleneck because assembled computers are backing up at department 4. Quality testing cannot be performed fast enough to keep up with the inflow of computers coming from departments 1, 2, and 3. A limitation of labor hours available to perform testing is causing this backlog. Step 2. Optimize the use of the constrained resource. Figure 7.16 Contribution Margin per Unit of Constrained Resource for Computers, Inc.
Based on the information presented in Figure 7.16 "Contribution Margin per Unit of Constrained Resource for Computers, Inc.", and given that labor hours in department 4 is the constraint, Computers, Inc., would optimize the use of labor hours by producing the S150 model because it provides a contribution margin of $800 per labor hour versus $500 for the A100 model, and $625 for the P120 model. Step 3. Subordinate all nonbottleneck resources to the bottleneck. The goal in this step is to shift nonbottleneck resources to the bottleneck in department 4. At this point, improving efficiencies in other departments does little to alleviate the bottleneck in department 4. Thus Computers, Inc., must try to move resources from other areas to department 4 to reduce the backlog of computers to be tested. Step 4. Increase bottleneck efficiency and capacity. Management’s goal is to loosen the constraint by providing more labor hours to department 4. For example, management may decide to move employees from departments 1, 2, and 3 to the quality testing department. Another option is to authorize overtime for the workers in department 4. Perhaps management will consider hiring additional workers for department 4. Step 5. Repeat steps 1 through 4 for the new bottleneck. Once the bottleneck in department 4 is relieved, a new bottleneck will likely arise elsewhere. Going back to step 1 requires management to identify the new bottleneck and follow steps 2 through 4 to alleviate the bottleneck. Most companies have limited resources in areas such as labor hours, machine hours, facilities, and materials. The theory of constraints is an approach that enables companies to optimize the use of limited resources. Five steps are involved. First, find the constrained resource (or bottleneck). Second, optimize the use of the constrained resource. Third, subordinate all nonbottleneck resources to the bottleneck. Fourth, increase bottleneck efficiency and capacity. Fifth, repeat the first four steps for the new bottleneck. Calculate the contribution margin per unit of constrained resource for each glove. Which two gloves would Southside prefer to produce and sell to optimize the use of machine hours in the quality testing department? The company would prefer to produce and sell the child and teen gloves, since these products have the highest contribution margin per machine hour.